Each Predator drone in the US arsenal costs between $4.5 and 10 million which puts them out of the reach of most forward-operating battalions who normally get stuck with smaller, unarmed UAVs. 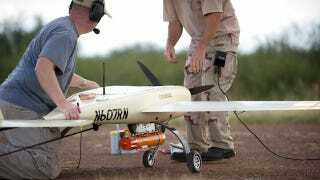 This new guided munitions from Raytheon is about to make those little fliers way more deadly. Smart Tactical Munitions are Raytheon-developed, guided munitions specifically designed to fit onto small and medium UAVs, like the Shadow (wingspan of 20 feet), rather than the conventional hunters-killers, such as the Predator and Reaper drones (wingspans of 55 and 84 feet, respectively). In fact, it was actually forward-operating Marines that requested arming these UAVs in the first place. SMTs weigh 12 pounds and measure 22 inches long. This light weight means that they can be deployed on more and smaller attack platforms, both manned and unmanned. And, the small warhead—only five to seven pounds—drastically reduces the collateral damage inflicted. Think, hitting the fly with a swatter rather than a sledge hammer. The SMT can be controlled in a variety of ways as well. The operator guide the attack using GPS coordinates, inertial navigation or laser designation, as well as dictate whether it will explode with a height-of-burst, point-of-impact or fuse-delay detonation. Its semi-active laser seeker also makes it effective against moving targets. You can keep up with Andrew Tarantola, the author of this post, on Twitteror Google+.